Why host a traditional backyard barbeque complete with hamburgers and hotdogs when you can do so much more? This year instead of hosting an ordinary BBQ, consider hosting a Hawaiian Luau. A Hawaiian Luau is an outdoor feast that includes listening to Hawaiian music and eating traditional Hawaiian foods. Like traditional American barbeques, Luaus are a time of great celebration where people gather to eat, drink and be merry. 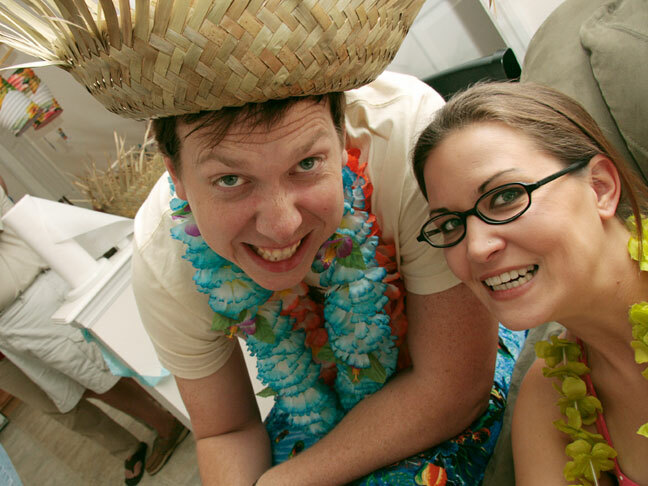 When planning a Luau, consider the following ideas to help you being your planning. Set the theme for your party early by sending out Hawaiian Luau themed invitations. Choose invitations with tropical flowers or tropical pictures to get people inspired about the theme for your party. Luaus are often held under tents where flowers set the stage for an Island party. Visit your local craft store and purchase lots of silk flowers. Wrap the tent poles in leaves, ferns and red ginger. Centerpieces can be as simple as placing leaves and ferns in a line down the center of the table. Tiki torches can also add a nice touch to your Luau themed décor. Hawaiian music is a must at your Luau. Play a CD or download some Island inspired music to your iPod and let it fill your space. If some of your friends happen to play the ukulele, ask them to play for your party. Beware: your guests may start randomly hula dancing. Invite your guests to wear tropical clothing. Bold, floral prints would most definitely be appropriate for a Hawaiian Luau. Don’t be surprised if some of your guests arrive in grass skirts! As an added touch, make flowers available to your guests to place behind their ears. Be sure to welcome each guest by saying “Aloha” and by presenting them with a lei. You can make your own leis from real or silk flowers or purchase plastic ones at your local party supply store. If you know a hula dancer, it can be great fun and entertainment to provide a hula lesson to your Luau guests. Limbo contests are also fun. You’ll want to have a tropical themed prize ready for the winner. Be sure to serve up lots of classic Island beverages including the Mai Tai at your Luau. Don’t forget to add a paper parasol to each drink before serving. As a non-alcoholic beverage option, serve up tropical fruit punch. Consider serving traditional Luau food including roasted pig, salted salmon with tomatoes and onions, tropical fruit and coconut pudding at your Luau. To learn more about the history of Luaus, for a classic Mai Tai recipe and a complete sample Luau menu, click here. Have you ever hosted a Hawaiian Luau? What other ideas do you have to make a Luau a success?